to have in connection with your proposed importation. whether the material is enterable into the United States. 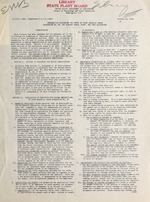 regulation 2, 3, 14, or 15.
paragraph B, of this circular. as enmArized in Section II, paragraph C.
be furnished as to the restrictions. ter in unlimited quantities under the continuing permit. erries appears at the end of this circular. for the purposes stated in the regulation. for permit, will be explained promptly to the applicant. is to cone by mail, in baggage, or by freight or express. If by mail, state the estimated number of packages. er with any special instructions received with the permit. kind of insect pest or plant disease. III. Ship the plants free from soil. if the permit specifies a definite quantity. place these inside the parcel when shipping by mail. on the tags will identify the shipment on arrival. ing them with tags for other shipments. the postmaster or customs official at that place. notice of shipment need not be submitted by the importer. tons entry, for which am Invoice is necessary. by regulations 10 and 11. 4. Opening a repacking cases incident to Inspections. for Improper or prohibited packing. IV. For importations brought in as baggage. Section II, paragraph D, III. limits entry to a specified port. one of the following points for inspection: Washington, D.
is to be paid to the postmaster at that place. submitted by the importer for shipments arriving by mail. ment which should properly be met by the importer. ing material for bulbs, corns, nuts, and seeds. (See reg. seeds, and nuts, mots the requiremnts. flict with necessary action as per paragaph L, folleing. at the expiration of the 80-day period. postql regulations covering the procedure. advance of the arrival of the shipet. Chief, Bureau of Intiolola end Plant Ruarantine. Plant quWatine Act of August 80, 1912. (Appendix B, Quar. Australia, Austria, Aoes, Barbados, Beglim, Bermda, Br. ward Islands (anad, St. Ilcia, St. Vincent). A dded sines publication of Appendix Z.